Why is the Arctic So Sensitive to Climate Change and Why Do We Care? That the Arctic should be especially sensitive to climate change was recognized in the 19th century. The primary reason for this sensitivity is that an initial warming (or cooling) sets in motion a chain of events that amplify the warming or cooling. This chain of events is known as the albedo feedback. Albedo is a measure of how white, or reflective, a surface is. Much of the Arctic is overlain by snow and sea ice, the latter covering much of the Arctic Ocean. Fresh snow and snow-covered sea ice may have an albedo higher than 80%, meaning that more than 80% of the suns energy striking the surface is reflected back to space. 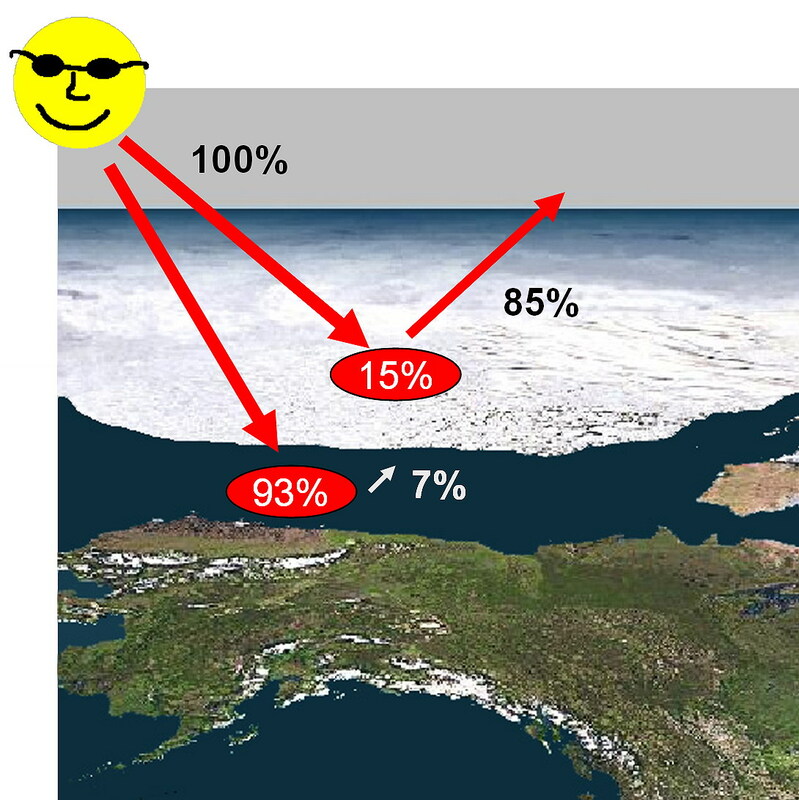 Even when melting in summer, sea ice has an albedo of more than 50%. The Greenland ice sheet, ice caps and glaciers further contribute to the overall whiteness of the Arctic. Consider what happens if the earth's surface starts to warm. Some of the highly reflective snow and ice in the Arctic starts to melt. This exposes underlying surfaces, which have a much lower albedo. The albedo of ocean water, for example, is less than 10%. These darker surfaces absorb more of the sun's energy (Figure 1), meaning that the Arctic gets a little warmer. Since it's a little warmer, even more snow and ice melt, exposing more of the dark underlying surfaces, leading to even further warming. This is the basic albedo feedback. The feedback can also work in reverse. If there is an initial cooling, melt is reduced, so less of the sun's energy is absorbed, meaning further cooling, even less melt, and so on. There are many complications. For example, in winter, the Arctic gets little or no solar energy, so the albedo feedback can't really work at this time in a direct sense. This contrasts with summer, when, depending on latitude, there can be up to 24- hours of daylight. We hence have to refine our thinking a bit. What happens is that with initial warming, spring melt, and the exposure of dark surfaces, comes a little earlier in the season, and autumn freeze-up comes a little later. Hence there is a longer period of the year over which dark, strongly absorbing surfaces can absorb solar energy. A rather odd manifestation of the albedo feedback seen in essentially all climate model projections through the 21st century is that the strongest Arctic warming will actually be in autumn and winter over the ocean, when there is essentially no sun. This is explained in that warming leads to a longer and stronger summer melt season and hence less sea ice. With less sea ice, the dark ocean picks up more heat through summer. As the sun sets in autumn, the ocean then releases this heat back to the atmosphere, acting to warm it. The effect can persist through much of the winter. This can be thought of as a delayed seasonal effect of the albedo feedback. Finally, the Arctic atmosphere is strongly stable, meaning that it doesn't like to mix. As a result, instead of mixing through the atmosphere, the heating effect of exposing dark surfaces tends to stay focused near the surface. The albedo feedback seems to be at work in the Arctic today. Particularly due to declining sea ice extent, autumn temperature rises over the Arctic Ocean over the past decade have been especially strong compared to the rest of the planet. This "Arctic amplification" should get even stronger as the decades pass. Why do we care? Everything in the climate system is connected together. Strong warming in the Arctic has the potential to impact on things like storm tracks, patterns of precipitation and the frequency and severity of cold-air outbreaks in middle latitudes. Some scientists think that we are already seeing such effects.